Texas A&M International University (TAMIU) Professor of Psychology Dr. Roberto Heredia has been named Regents Professor by The Texas A&M University System Board of Regents. 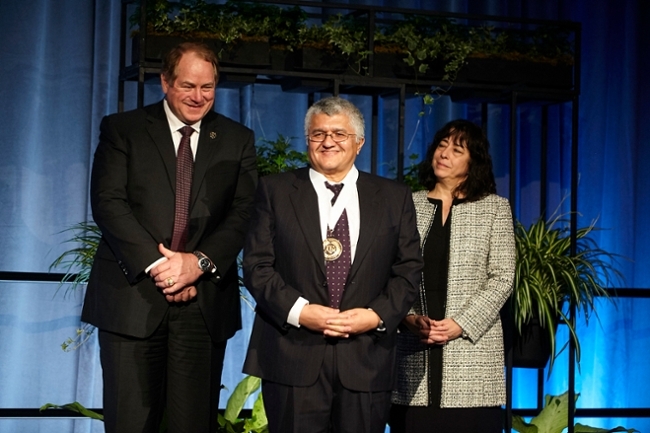 Dr. Heredia was among 11 faculty members and seven agency service, extension or research professionals within the A&M System who were recently designated Regents Professors and Regents Fellows for 2015-2016. Heredia said he feels honored to have been named Regents Professor. This year’s recipients of the Regents Professor Award are: Dr. David E. Bergbreiter, Texas A&M University, Professor of Chemistry; Dr. Samuel D. Brody, Texas A&M University at Galveston, Professor of Marine Sciences; Dr. Jeffrey D. Cirillo, Texas A&M Health Science Center, Professor of Microbial Pathogenesis and Immunology; Dr. Roberto R. Heredia, Texas A&M International University, Professor of Psychology; Dr. Kim D. Jones, Texas A&M University-Kingsville, Professor and Director, Institute for Sustainable Energy and the Environment; Dr. Mladen Kezunovic, Texas A&M University and Texas A&M Engineering Experiment Station, Professor of Electrical and Computer Engineering; Dr. Larry F. Lemanski, Texas A&M University-Commerce, Professor of Biological and Environmental Sciences; Dr. Robert L. Ohsfeldt, Texas A&M Health Science Center, Professor of Health Policy and Management; Dr. Vijay P. Singh, Texas A&M University, Professor of Biological and Agricultural Engineering; Dr. Marilyn Spencer, Texas A&M University-Corpus Christi, Professor of Economics; Dr. Ryland F. Young III, Texas A&M University and Texas A&M AgriLife Research, Professor and Sadie Hatfield Professor of Agriculture. Recipients of the Regents Fellow Service Award are: Lisa K. Akin, Texas A&M Engineering Experiment Station (TEES), Director of Risk and Compliance; Dr. Jon A. Epps, Texas A&M Transportation Institute (TTI), Executive Associate Director and Senior Research Fellow; Donald Galloway, Texas A&M Forest Service (TFS), Chief of Staff; Lesa K. Hill, Texas A&M Engineering Extension Service (TEEX), Division Director; Dr. Jason B. Moats, Texas A&M Engineering Extension Service (TEEX), Program Director; Darlene Myatt; Texas A&M AgriLife Extension Service, Extension Agent; Dr. Joe L. Outlaw, Texas A&M AgriLife Extension Service, Professor and Extension Economist. right, Regent Vice Chairman Elaine Mendoza.